Thank you very much for the email and press release. I appreciate your sending this to me, and the offer of an interview with Stephen Hammond. I would be very interested in having an interview with Stephen Hammond, on behalf of the Cycling Embassy of Great Britain, of which I am a Board Member. I would particularly like to find out if the new Road Safety Minister considers it a priority for the government to achieve far more emphasis on the provision of safe, high-quality, separated cycling infrastructure for cyclists in the UK. In the Cycling Embassy of Great Britain we consider that this will be the only effective way of reducing the distressingly high casualty rate of cyclists on our roads. Eighty-seven have been killed so far this year, and four in one day, the 5th September. We consider this is not a problem that can be addressed merely with publicity campaigns calling for better behaviour from road users. Most of our road designs are highly outdated and constantly force cyclists and motor vehicles into conflict, in sharp contrast to the road designs of many of our continental neighbours, particularly those of the Netherlands, Denmark, Sweden and Germany, where the issues around accommodating much larger numbers of cyclists than we have here, more safely, have been effectively solved. We would therefore be very interested to find out how the minister regards this issue, and what plans he might have for addressing it. The Cycling Embassy of Great Britain, which is dedicated to identifying and sharing best practice on cycling infrastructure, would very much like to work with him on practical solutions. The first ever cycling road safety campaign from THINK! was launched this morning by the new Road Safety Minister, Stephen Hammond. ‘THINK CYCLIST’ is calling on drivers and cyclists to stay safe this autumn by looking out for each other – and pointing out that drivers and cyclists have more in common than is often realised. With 80% of cyclists holding a driving licence, and 1 in 5 drivers cycling at least once a month, they’re often the same people. With the ‘Wiggins Effect’ putting more people on the road, staying safe is a priority. This is the Road Safety Minister’s first opportunity to speak to cyclists and drivers about road safety. If you would like an interview with Stephen Hammond please let me know. A new poll for the Department for Transport’s THINK! campaign has found that 25% of UK adults are noticing more cyclists on the road after our cycling summer of success. With the ‘Wiggins Effect’ putting more people on the road, staying safe is a priority. A new THINK! 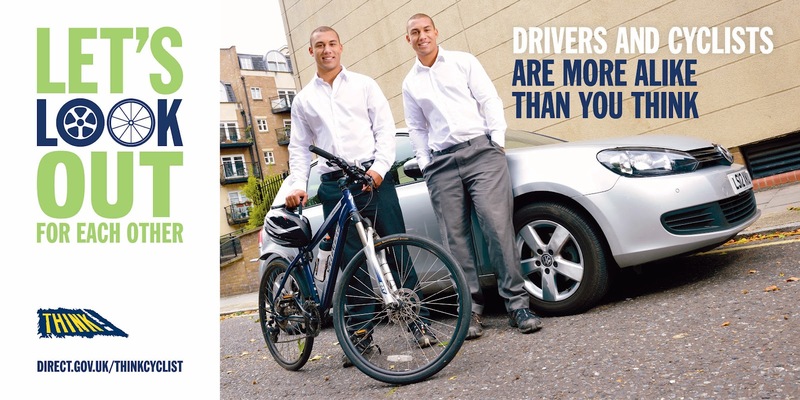 Campaign, ‘THINK CYCLIST’, calls on drivers and cyclists to stay safe this autumn by looking out for each other – pointing out that drivers and cyclists have more in common than is often realised. With 80% of cyclists holding a driving licence, and 1 in 5 drivers cycling at least once a month, they are often the same people. The THINK CYCLIST poll has also showed that cyclists and drivers agree on how to stay safe on the road. · Looking twice for each other when turning or at junctions came out top for both as the precaution that would avoid the most collisions (41% of regular cyclists, and 35% of regular car drivers). · Both also agree on how to make things better, with 67% of cyclists and 59% of drivers saying that giving each other space on the road was in their top three ways of making cyclists and drivers more visible to road users. “We take the issue of cycle safety extremely seriously so we are launching ‘THINK CYCLIST’, a campaign aimed at both cyclists and drivers. “With interest in cycling heightened by Bradley Wiggins winning the Tour de France and our cyclists’ extraordinary success at the Olympics and Paralympics too, we want to remind cyclists and drivers of the importance of looking out for each other to avoid accidents. The Mayor of London, Boris Johnson said: "The safety of London's road users is an absolute priority for me and improved cycle safety in particular is at the heart of all our work. So with ever more Londoners taking to the streets on two wheels, many inspired by our amazing summer of sport, the THINK CYCLIST campaign is a timely reminder of the need for road users to respect each other and make the city a safer place." This is the first time that THINK! has targeted cyclists and drivers together, and the campaign has the support of organisations such as the RAC, AA and IAM The campaign will be working with motoring and cycling organisations nationally and locally to help to get safety messages to their members. AA President Edmund King said: "There are too many accidents between cars and cyclists. We need to look for each other whether opening a car door or changing lanes. As fuel prices rise and fitness moves higher up the agenda there will be more cyclists. Drivers need to think more about cyclists on the road." For further information please call Ella Sunyer or Cheryl Campsie on 020 7403 2230 or 07961 145 953 or Ella on 07859 078 932 or email ella@forster.co.uk /Cheryl@forster.co.uk. Give cyclists space – at least half a car’s width. If there isn’t sufficient space to pass, hold back. Remember that cyclists may need to manoeuvre suddenly if the road is poor, it’s windy or if a car door is opened. Ride positively, decisively and well clear of the kerb – look and signal to show drivers what you plan to do and make eye contact where possible so you know drivers have seen you. 4. All figures, unless otherwise stated, are from YouGov Plc. Total sample size was 2117 adults. Fieldwork was undertaken between 21st - 23th August 2012. The survey was carried out online. The figures have been weighted and are representative of all UK adults (aged 18+). The number of pedal cyclists killed fell by 4 per cent from 111 in 2010 to 107 in 2011. The number of seriously injured casualties increased by 16 per cent to 3,085. Intriguing that there are 3 motoring organizations quoted in the press release but no cycling organizations. Smorgasbord, it's not really that intriguing - it simply indicates that none of the cycling organizations support this campaign. I was sent that too. It comes across as another remarkably weak piece of work from a government which really isn't all that interested in cycling, and certainly isn't listening to what is required. I have already tweeted about this, but to be quite blunt, just because people other than Kanye West would think £80,000 is a lot of money, it is *naff all* in the grand scheme of things. I played around on the Range Rover site and managed to specify one with a 4.4 litre turbo Diesel and with all the optional extras that would cost me £109,840. This included optional 22 inch alloys that cost £3000 a set. There are numerous other comparisons with luxury consumer goods that cost a lot of money (30 litre bottle of Ace of Spades, anyone?) that can be used to demonstrate that our government are a bunch of cheapskates when it comes to things that non multi-millionaires can enjoy on a routine basis (ie cycling). The problem is that when big money does get spent it is usually a wasted opportunity for cycling, such as on Exhibition Road. If this government wants to spend money on cycling and see it get wasted, they are more than welcome to pay for something crazy (eg a carbon fibre Christiania) or one of those time trial helmets the Swedish Olympic team wore. Finally, while the Olympics have given cycling an image boost, can anyone imagine this particular campaign being mentioned in a "I heart 2012" compilation on BBC Three in ten years like the 50 Shades trilogy, YOLO*, the Mobot, or the Cruel Summer album might be? No, it will be forgotten like the fourth placed contestant in some low rent reality show. Jimmy Savile this is not. * = You Only Live Once. Commoner's version of "carpe diem". To emphasise and expand on the previous comment: This is supposed to be a NATIONAL campaign. £80,000 is a generous advertising budget in some other contexts (eg, advertising within the Bristol and Bath area), but when you consider a full page colour advert in a national newspaper costs about £35,000, and a 1 month billboard slot £1,000; the budget is almost nothing when production costs are considered.